Marie Kondo, author of The Life-Changing Magic of Tidying Up and Spark Joy, admits in the latter book that the process of sorting photos with her family was the tidying job that brought her the most joy. She highly recommends tidying photos together as a family to encourage story-telling. Even the guru of tidying and decluttering realizes how important the weight of our personal photo collections are! I was remined of this as I was perusing my photo albums. I found quite the “meta” family photo in my album, an image of my parents and brother looking at photo albums - an image capturing an endless loop of memory making and memory enjoyment togetherness. It is evident we were having so much fun looking at photo albums the moment needed to be documented as well. Albums are scattered across the dining table; everyone is standing and gathered around; Dad is grinning; Mom appears to be thinking hard about some particular point; and my brother is taking a closer look at a photograph. I can’t be sure, but we may have all been searching for photos to include in a slideshow created for my wedding rehearsal dinner. Research in psychology shows time and again that investing in making happy memories with family has a positive return on investment. Children, and even us grown-up children, will draw on a bank of positive memories to help cope with more stressful or turbulent times. When families revisit memories with loved ones through photographs, bonds are strengthened, relationships deepen, and memory improves. It is also just plain fun to look back at the way things used to be, as time was passing before you realized it, as the children grew overnight, as traditions were practiced over the years. Now that I have a family of my own, I am encouraging the grandparents to transition possession of family albums to the next generation. When the grandparents come to visit several times a year, I remind them to bring another photo album with them to share with their grandson. I then make a plan to rescue the photos from those terrible, sticky, magnetic albums and scan the photos. Sharing memories and photos with the littlest family member helps him feel connected to a larger story, and he gets a kick out of seeing his parents at the same age he is. Someday we will come across a photo of my son sitting on his grandmother’s lap, a photo album open in front of them, grandma pointing something out in a photo, and we will feel pure joy. September may signal our hot and dry Summer is coming to a close but it also signals Save Your Photos Month! 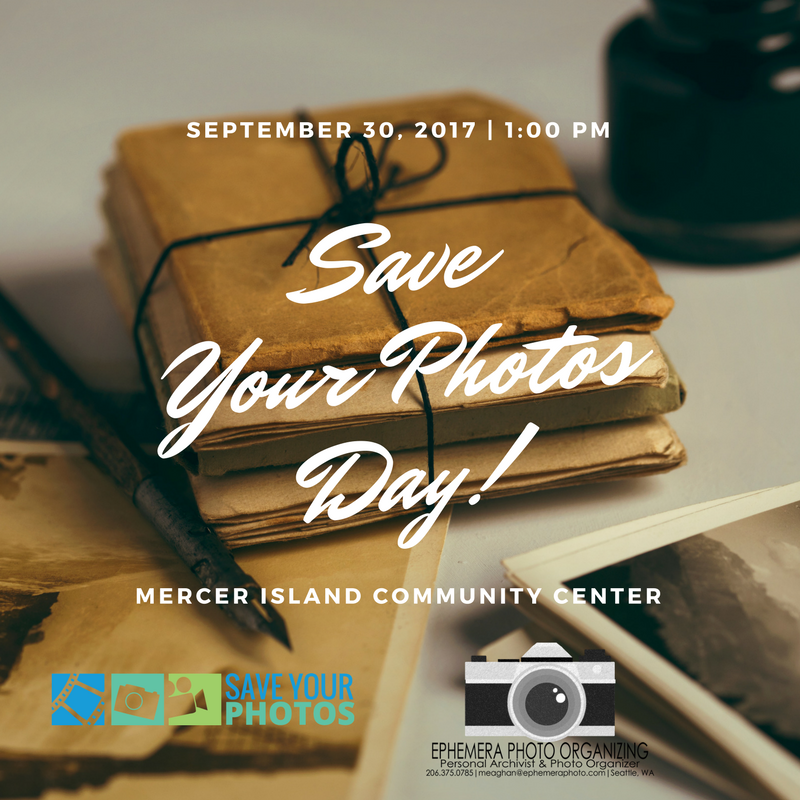 Save Your Photos Day is a free, annual event that offers real advice and resources for what you can do to safeguard your memories before disasters and accidents occur. Myself and local personal photo organizers will share our expertise about organizing, scanning, preserving and sharing your memories. Please come join us and bring your questions! It has been a busy start to the new year around here. I am so glad so many of you are serious about starting your photo organizing projects! I found this vintage photo processing envelope with sage advice. Family Circus touched on organizing photos, and it got me wondering: are we really ever done? Houzz is has been posting some helpful articles on organizing your printed and digital photos for those DIYers out there. 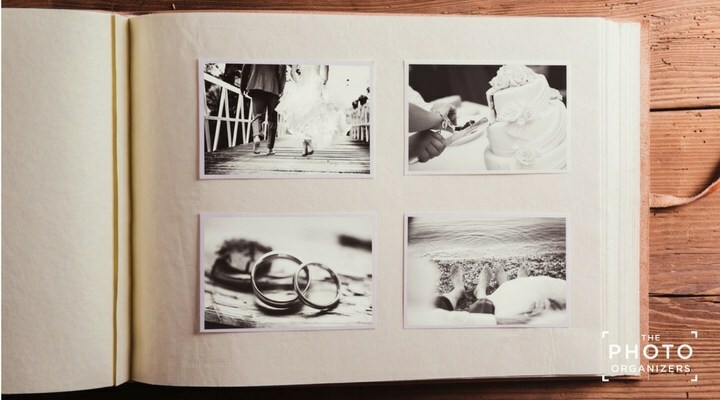 Certified Personal Photo Organizers are always ready to help!